This dress can be dramatic or laid-back, depending on how you choose to accessorize. We love that it has a bit of a natural, safari-inspired feel to it. 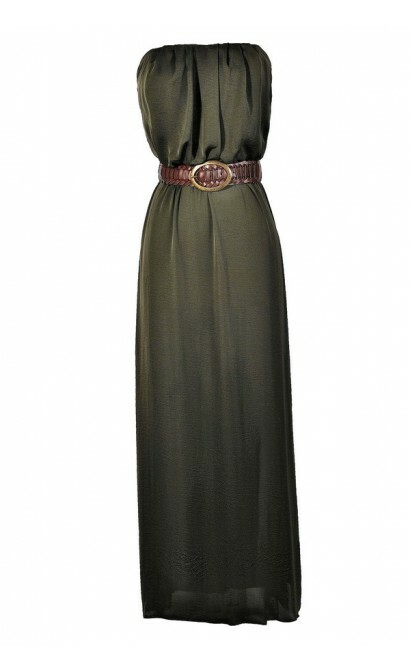 The Give It Your Olive Belted Maxi Dress is lined at the bust only. It is made of a silky fabric in an olive green/forest green color. It has a strapless neckline with an elasticized band at the back that expands to fit. The loose blouson shape at the bust adds a laid-back vibe. The attached skirt has a full length maxi cut. The best part of this dress is the empire waist with an included brown belt that wraps around and ties this whole look together. The Give It Your Olive Belted Maxi Dress is perfect to pack on vacation somewhere warm. Wear it with brown wedges or heels for dinner with friends. Or dress it down with flat sandals and an oversized bag while running errands. This is a lovey dress in an earthy color. Details: Lined at bust. Belt included. 100% polyester. Lining: 100% polyester. Remove belt. Machine wash cold separately. Gentle cycle. Only non-chlorine bleach when needed. Line dry. Cool iron if needed. Small measurements: Length from top of bust to hemline: 50". Bust: 32". 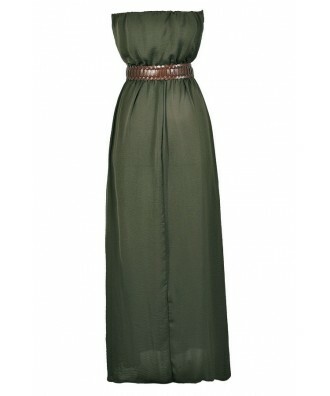 You have added Give It Your Olive Belted Maxi Dress into Wishlist. You have added Give It Your Olive Belted Maxi Dress for Stock Notification. You have set Give It Your Olive Belted Maxi Dress as a loved product. You have removed Give It Your Olive Belted Maxi Dress as a loved product.